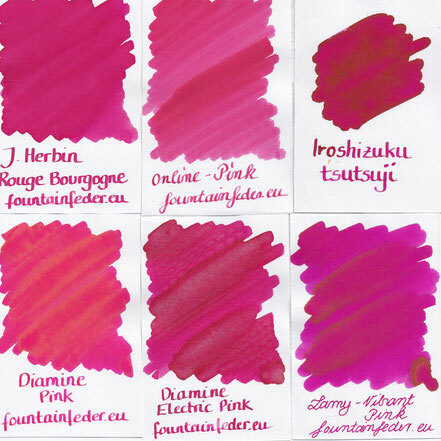 Vibrant Pink shenanigans - fountainfeders Webseite! Lamy released their new Al Star Model "Vibrant Pink" with matching ink. As you probably dont know, we are not a regular Lamy seller. Lamy does not supply Online shops in Germany. We would have to have a regular store with certain sales to even get considered by Lamy. Another fun fact about the Lamy special edition ink is, that the bottles are not available in Germany. You can only get cartridges. Lamy just does not supply the German market with the bottled Version of the ink. So for us to get the bottles for ink samples, means we have to order it outside of Germany for the regular price as well. Funny isn't it...not. As you can tell it is a lot of work just to get the regular ink for samples back to Germany ;-). So we put up a little comparisson of the Pinks available in our online shop. 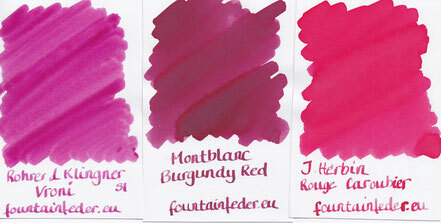 Maybe you find another Pink that you like even more than the Lamy one...who knows. Have an inktastisch day and greetings from the freezing cold Bavaria.